Here is a highly unusually styled radio from the famous liaison of these two premier companies. 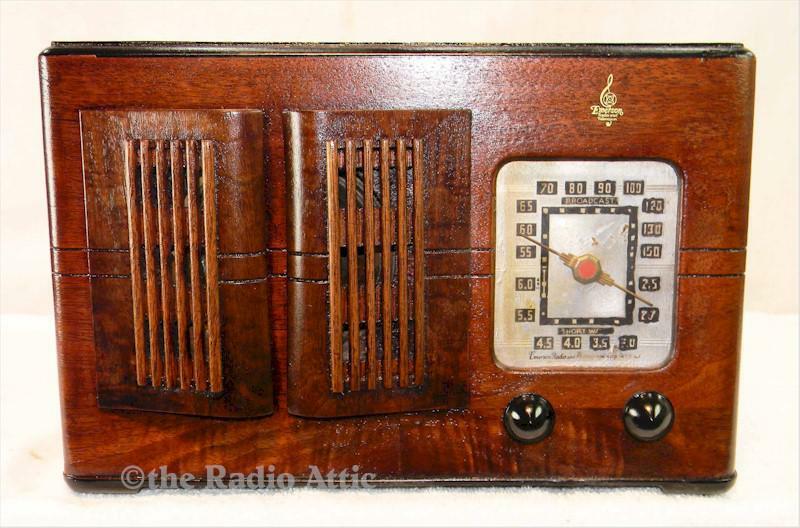 The radio displays all of the wonderful use of exotic veneers and craftsmanship that makes these radios especially collectable. Many collectors prize these radios for the unique silhouettes. This particular set is a rather scarce model which retains the foil medallion from Ingraham Cabinets. The radio has been refinished by a prior owner and the work decently resembles the factory original work. Contained within is an "All American Five" chassis, with the factory installed loop antenna for optimal reception. The radio is an AM/SW model. Everything is a factory installed part, with only the dial face showing wear for the 80 years of service. Les has done his professional repairs and the set is a fine and stable player. Les added a mini-jack for your installation of any modern device to the radio. This will give you an unlimited choice of content and stream via Bluetooth with the additional $25 device. 13-3/4"W x 9"H x 6-3/4"D.
You are visitor number 1,934 to this page.